If you are managing a non-profit business, then you will need to create a budget. Creating a non profit budget spreadsheet is the most effective method. If you’re unfamiliar with spreadsheets, then it can seem like a pretty daunting task. It doesn’t have to be difficult, and this template guides you step-by-step through the entire process. It enables you to customize it with your company’s information. First, fill in all the boxes with your company’s specific information. This will consist of your company’s name, address, phone numbers, fax number, email address, and company logo. Next, create the fields where you will track incoming funds. You will need fields for expenses and revenue. Don’t forget a field for cash flow and any possible revisions. Lastly, you will need to create fields for each income and expense source, including names, addresses, phone numbers and email addresses, if applicable. Breaking down your projected spending for the next fiscal year into categories will make creating and analyzing your non profit budget spreadsheet easier. Just like the projected spending, categorize your expected income as well, ensuring to use specific source names and projected amounts. For example, you could put $1,000 for fundraising activities. When estimating expenses, it’s important to be as accurate as possible. Of course if you’re a new non-profit, this might be challenging. Just do the best you can. If necessary, seek advice from your accountant or another reliable source. Every non-profit needs a non profit budget spreadsheet in order to appropriately control their expenses, as well as show proof to funders of how funds are being used. A well-kept budget will ensure that funders will continue to invest in your non-profit in the future, and it also helps you to control business spending, as well as execute a specific plan. 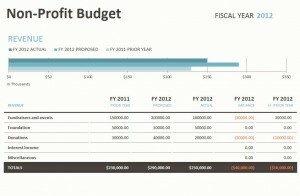 This non profit budget spreadsheet template is free and will walk you step-by-step through the process.